The Aurangabad division of FDA has found sildenafil citrate, commonly known as Viagra, and a short-acting anaesthetic drug in two ayurveda medicines meant to increase sexual desire and potency that were randomly tested for quality recently. The worrying finding has prompted the drug regulatory body to issue a statewide circular asking its officials to seize any available stock of these drugs— Power up capsules and Tiger king cream. The containers of both the ayurvedic medicines didn’t mention the allopathic components sildenafil and anaesthetic drug (lignocaine hydrochloride), giving rise to fear of serious health consequences in people who might consume them unknowingly. Viagra, in particular, which is given for erectile dysfunction, is supposed to be taken only when prescribed by a specialist as it can react with other ongoing medications and give rise to life-threatening complications. In July, FDA officials raided the office of Srishti Unani Medicine Agency in Aurangabad and found stocks worth Rs16,000 that had arrived from Saharanpur district of Uttar Pradesh. 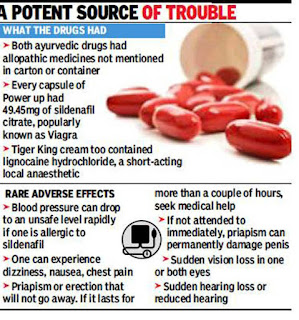 Tests revealed each Power up capsule contained 49.45mg of Viagra, while Tiger king cream had a significant amount of lignocaine hydrochloride, though only the herbal components were mentioned in the packing material. The spurious drugs were manufactured in violation of the Drugs and Cosmetics Act. “We will lodge an FIR against Naman India, the UP-based manufacturer, that has been selling these drugs in the name of herbal medicine to gullible consumers,” said SS Kale, joint commissioner, FDA, Aurangabad. He said the department is yet to establish where these drugs were supposed to be distributed, but there is demand from across the state. It was during a raid in the city sometime in 2015 when the department woke up to rampant adulteration of so-called ayurveda medicines with allopathic drugs. An official said it was an “industry worth millions” that clandestinely ran out of Tier-2 and 3 cities or slums in metros. “Under the Act, manufacturing of ayurveda drugs needs a licence, but there are no legal provisions for distribution and supply. So monitoring becomes a challenge,” said an FDA official. Medically, doctors say, such rackets are not just about making spurious drugs and making quick bucks but messing with people’s lives. “It’s a menace that has existed for years unchecked. Ayurveda practitioners charge exorbitant sums for ayurveda medicines that illegally contain sildenafil, which otherwise costs just Rs 30-40 when sold as an allopathy drug. I have known cases where patients have paid Rs 4,000 for four ayurveda pills,” said Dr Rajan Bhonsle, head of sexual medicineat KEM Hospital. He said with an increasing number of youngsters grappling with erectile dysfunction and many opting for so-called ayurveda medicines believing them to be free of side-effects, such scams can have serious consequences. “Adulteration is also bringing a bad name to the science of ayurveda,” said Dr Laxman Jadhav, president of state branch of National Integrated Medical Association. “Registration of fraudulent firms must be cancelled,” he said.